Sometimes it's just about having a special space of your own for your tasks. It's not always about having lots of space, just THAT place that's yours. 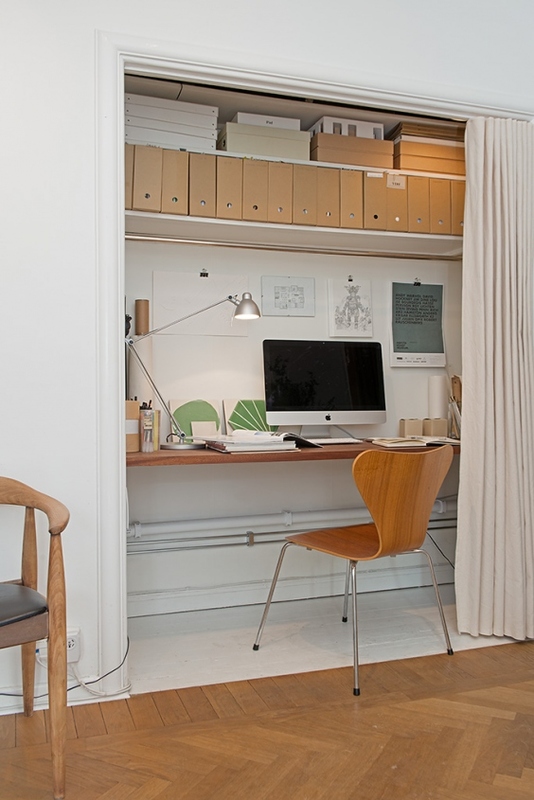 Here are 20 small home office space inspirations from Alvhem, a unique Swedish agency that is embracing interior design as well as real estate sales with beautifully decorated homes. From a nicely appointed home office to a mere closet space, these home offices show a loving attention to detail and decent task lighting. A task light usually doesn't have to illuminate the space brightly these days because most writing and reading is done on a computer, but it is still necessary for light reading. Incandescent, halogen, LED - so many choices. The choice depends on personal preference. There is no hard and fast rule, which option is the best. Flexibility is a good and so is sufficient lumens output. It is important that the light is positioned so that you don't throw your own shadow onto the reading material.